The 99 Cent Chef likes to have fun with fiction in his food featurettes -- as an example, in my Fab Hot Dog Video I have a radioactive reaction to a Chicago Dog topped with neon-green relish. This next video is a hot dog cautionary tale. This week, I channel great British thespian pub carousers like Peter O' Toole and the late Richard Burton. Now, I cannot afford a grand meal in Beverly Hills Spago, followed by swilling Crystal Champagne and $18 dollar martinis at the Beverly Hilton's bar like a movie star on a Hollywood Studio expense account. However, I can afford to dine and drink at Carney's: the dining train car that hosts the cheapest Hot Dog Happy Hour on L.A.'s notorious, and famed Sunset Strip, serving a trifecta of beer, hot dog, and fries for $4.75! Now on to Carney's. 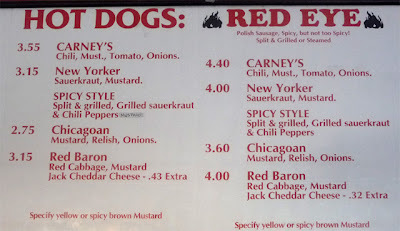 I like my hot dogs simply dressed with mustard, onions and relish, and they do it right. The buns are firm (not overly steamed and soggy); the dogs are tasty and have snap, and are grilled or steamed upon request. It is easy to eat a couple before you know it! And adding chili costs extra, but worth it for a hearty meaty topping. 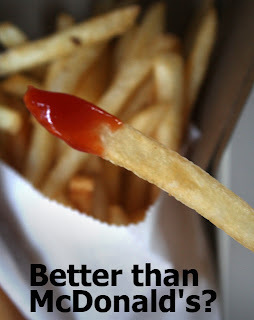 Another stand-out are their thin-cut string French fries -- very much like McDonalds or Burger King, but less oily, and not so over-salted. Eat them while they are hot and most crunchy. And, of course, I would be remiss in not mentioning beer - it is ice cold tap Budweiser and Miller. They also serve bottled foreign and domestic, but those are not included in the Happy Hour price of $1.50 per plastic cup. 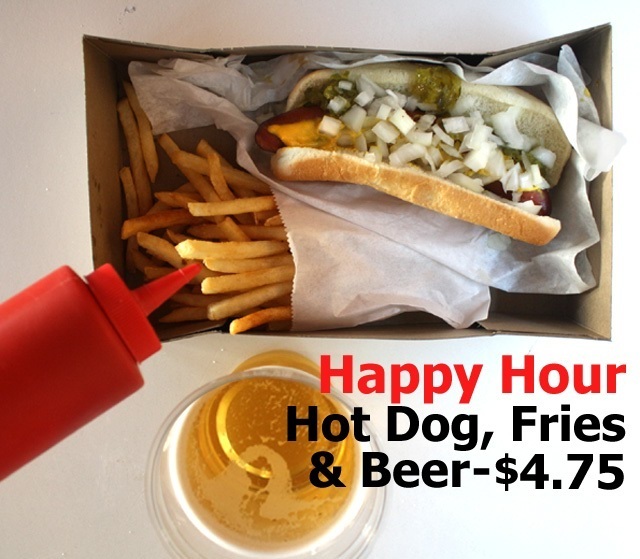 Normally a Bud runs $3.25, but for $4.75, on Wednesdays only, from 5pm - 7pm, you get a hot dog and fries included! 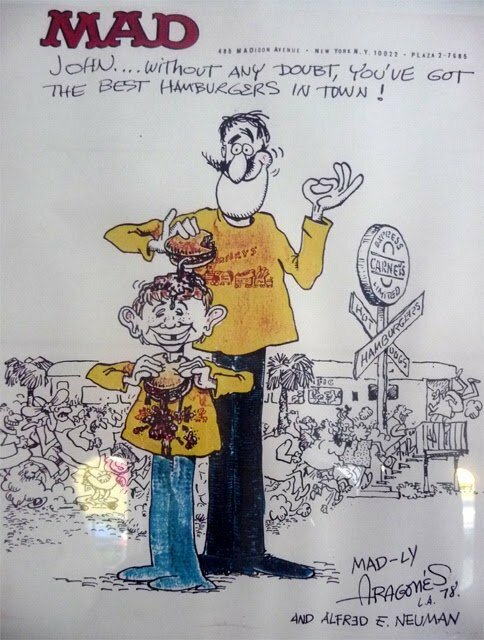 (I always make it a point to drop by Carney's on the way to Thursday Free Admission Night at the Hammer Museum). Carney's has an extensive menu including: burgers, chicken wraps, tuna melts, tacos, and salads. I especially like the Chili Burger. Monday is Hamburger Happy Hour with fries and a beer for, again, $4.75! -- adding chili and cheese costs a little extra. 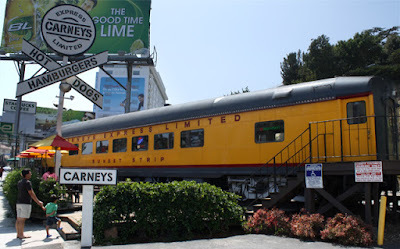 Carney's long Union Pacific dining car sits on a platform overlooking the Sunset Strip (you can see the upside-down Standard Hotel sign from a window seat) and the parking is free - a real deal for this part of West Hollywood. The place is spotless and service is fast and friendly. Tourists have discovered it but I've never found it too crowded to get a seat. Unlike most Hollywood eateries there are few celebrity headshots, but there is a hand-drawn cartoon by Mad Magazine's Sergio Aragonés right by the napkin dispenser -- my kind of place. As I write this I am sitting at my keyboard, in a wallflower - papered room, halfway through rehab, at the Betty Ford Clinic. But don't worry, it's all for the best, and I'll soon be back with another Hot Dog Video to share with you (hopefully by next week) and I promise, until then, to have nothing stronger than a cup of chamomile tea and a hot dog or two! Happy Hour is 5-7pm Monday through Friday. 99 thanks to Carney's cooks and patrons! For HTML to embed, or to just link from YouTube, click here.